Fight the War Against Draconic Oppression in this Adventure for the World's Greatest Roleplaying Game In an audacious bid for power the Cult of the Dragon, along with its dragon allies and the Red Wizards of Thay, seek to bring Tiamat from her prison in the Nine Hells to Faerun. To this end, they are sweeping from town to town, laying waste to all those who oppose them and gathering a hoard of riches for their dread queen. The threat of annihilation has become so dire that groups as disparate as the Harpers and Zhentarim are banding together in the fight against the cult. Never before has the need for heroes been so desperate. 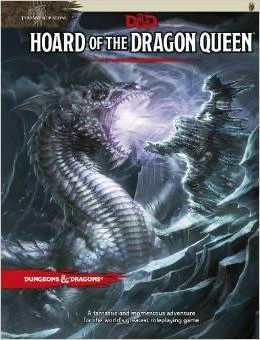 - The first of two adventures in the Tyranny of Dragons(TM) story arc, Hoard of the Dragon Queen provides everything a Dungeon Master needs to create an exciting and memorable adventure experience. - Fans of the Dungeons & Dragons(R) Roleplaying Game can get a sample of what this product has in store for them through the D&D Encounters(TM) in-store play program. - Adventure design and development by Kobold Press.